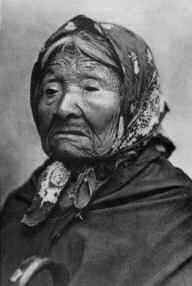 Nicknamed "Princess Angeline" by European-Americans, the daughter of Chief Seattle lived out her old age in the city named after her father. A young portrait photographer, Edward S. Curtis, often saw her on the streets of downtown Seattle or digging clams near the shack where she lived on Puget Sound. He became intrigued by her and often photographed her and chatted with her. "I paid the princess a dollar for each picture I made," Curtis recalled many years later. "This seemed to please her greatly, and she indicated that she preferred to spend her time having pictures taken to digging clams." His interest in Princess Angeline led him to become interested in photographing other American Indians, and he became far and away the best and most famous photographer of them.